The article below by Yonnie McInness appeared in the Ayrshire Post in February 2011. See also an explanation of the reconstruction process by Andrew Spratt below. 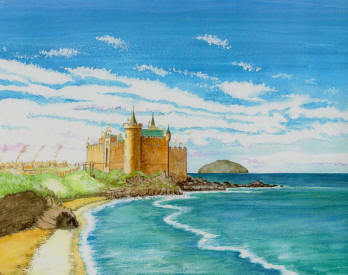 Turnberry Castle and King Robert the Bruce of Scots by Yonnie McInnes as published in the Ayrshire Post. The mysterious rubble remains of Turnberry Castle surrounding the now iconic lighthouse appear to be a confused muddle of grassy mounds. "However in the late 13th century this site was the great coastal stronghold of the Bruce family of Annandale, Earls of Carrick",said Andrew Spratt, monument manager at Dirleton Castle who, in his spare time painstakingly researches, reconstructs, and then brings long disappeared or ruinous castles back to life on canvas. He's spent the last 30 years producing paintings of many such castles around Scotland after spending the summer working beside his father at Tantallon Castle as a teenager. He began by doing an ink drawing of King James's blockade of Tantallon as his first reconstruction. Author Nigel Tranter was his mentor and from whom he borrowed a huge library of reference material. Andrew refers to his work as being a bit like putting together a huge jig-saw puzzle. Old prints supply vital clues for his reconstruction work. But, he admits, piecing together what Turnberry Castle actually looked like was a real challenge as there was only a few stumps of wall remaining on the site and there were no prints to use as a reference point. It took Andrew two days of mapping the site to determine that it had been divided into two parts with a gatehouse and keep courtyard and an upper main keep and boathouse. Andrew says it was possible to determine what Turnberry Castle had looked like by carefully charting, level-by-level, its original architectural elements. "Turnberry, a stone castle, was perched on the rocky promontory protected on three sides by the sea and defended on the landward side by a great dry ditch, still evident today", explained Andrew. "Inland sat the original village of Turnberry, with the usual collection of wood and wattle constructed buildings with thatched roofs. Containing houses, storage barns, stables, brewhouses and so on. Further still inland this castle-town would have been surrounded by a wooden palisade and protected by a second dry ditch with wooden gate house and fixed bridge. The stone castle itself astride its rock stacks was reached by a drawbridge with portcullis and was divided into two parts. 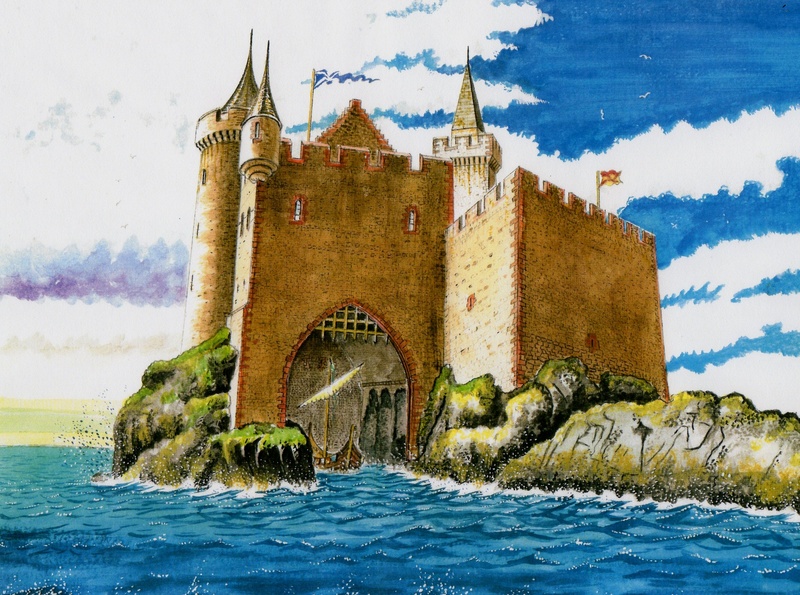 A lower gatehouse/keep and courtyard but also an upper Keep with D-plan tower and an unusual lean-to boathouse with seaward access for supply vessels, guarded by a huge seagate portcullis. " "In theory if the castle-town and castle courtyard fell during a siege, this boathouse could be used as a means of escape for the castle garrison if all else failed. Strangely the reverse is true of this defensive feature. When in 1307 King Robert the Bruce of Scots (1306-1329), entered Turnberry by way of this boathouse taking the unwelcome English garrison totally by surprise. The ancient site of Turnberry was originally held by the old Celtic Lords of Galloway, early Earls of Carrick during the reign of King William I of Scots( 1165- 1214). " "The castle may have been started by Duncan or his son Neil, who died in 1256. Neil's daughter Marjorieor Margaret married Robert de Brus (father of king Robert). & thus Turnberry passed to the Bruces,who added to the site. 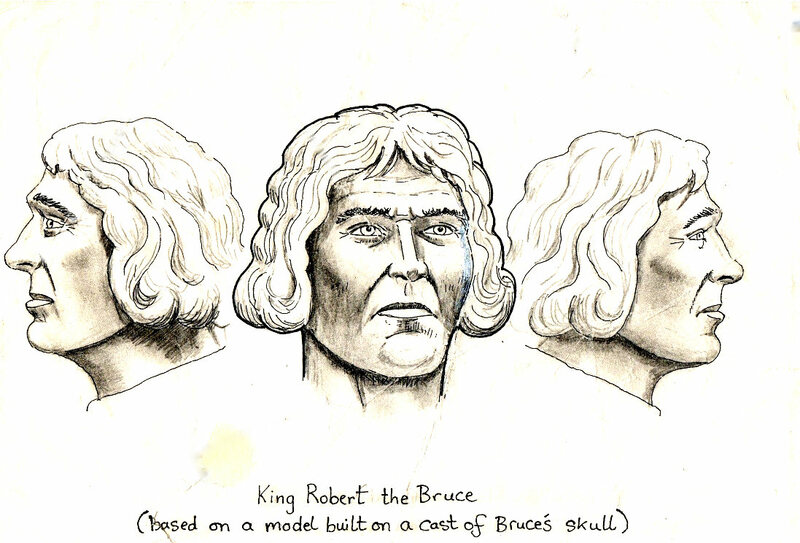 It should also be noted that Turnberry may be the birthplace of King Robert but other accounts claim he was born at Lochmaben castle (the wooden motte not the stone castle). Rather oddly Turnberry was burnt in 1297 by William le hardy Douglas. " 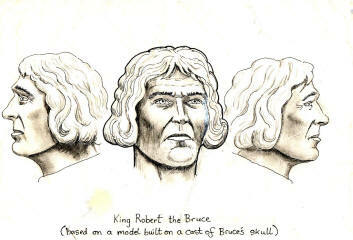 "The young Earl of Carrick (later King Robert) retaliated by burning the lands in Douglasdale and capturing Douglas' wife and young son James.Who ironically became the legendary Good Sir James the Black Douglas who carried King Robert's heart to Spain at the battle of Teba in 1330. Which was where Douglas died but the heart was returned to Scotland and buried at Melrose Abbey. " "In 1301 the English invaders seized Turnberry but were unable to stop the Scots in Carrick revolting and fled to King Edward I's (Hammer of the Scots) camp at Linlithgow, leaving token garrisons at the castles of Ayr and Lochmaben. In October 1301 the Constable of Ayr complained in a letter to King Edward that the Scots of Carrick were before the walls of Turnberry,with 400 men-at-arms and within these eight days wanted to attack Ayr. In February 1302 Ayr Castle was besieged by the Scots but with little success. Sadly Robert Bruce had already surrendered to King Edward, before revolting again later. " "And in 1307 he took Turnberry presumably slighting it preventing it and all other castles taken in the lowlands from being used as footholds and staging posts for the invading English. This policy paid off when in 1314 a massive overstretched English army snaking its way to Stirling were defeated at the battle of Bannockburn by King Robert the Bruce of Turnberry". In 1999 I spent two days mapping the site around Turnberry taking measurements,checking wallings for gateways,marks of portcullis grooves,windows,doorway footings,signs of turnpike stair wells showing a building was more than just one storey high etc. I also took many slide shots as I used these views, not only in my finished slide shows but as a tool to help rebuild the castle reconstruction as near accurate and to scale as possible. To explain I projected a slide of the ruin onto an A3 sheet of plain paper. I then pencil round the outline noting the location of walls/towers and land features. Then using the two day mapping measurements I draw the reconstruction in black pen,using a ruler since these elements have to be measured exactly to fit the site. Its as if I were rebuilding the castle level by level right,stone by stone right up to roof level, uing examples of more intact towers from all over Scotland. Its guess work but educated guess work. The next stage was to use the A3 pencil/pen drawing as a template to trace through onto a sheet of embossed water-colour paper. While detailing the finished painting I again projected the slide from time to time checking colours and shading match for the whole building. By doing the reconstruction in these stages instead of simply drawing free hand there are less chances of mistakes in the finished work. Also because there was a question mark over the castle courtyard because of the position of the modern light house. I stuck to the site strengths cheating slightly by only doing views from the side and seaward view,because I was totally sure of the position and form of the Gatehouse,D-Plan tower and Boathouse leaving what was uncertain hidden from view. Hopefully I have contributed something of worth to Scottish history in my reconstructions of Scottish castles and battles. I have tried to breath life back into ancient ruins like Turnberry to show real people lived there. Castles like Turnberry were symbols of status,wealth and power. Not only were they family homes providing protection for local surrounding villages. But were used as war platforms for launching attacks on other nearby hostile power hungry families. 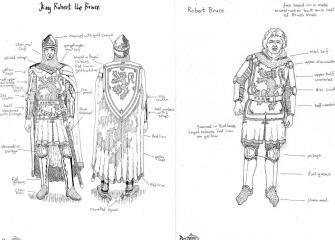 I've tried to make history more interesting for children in my drawings,talks and costumed tours in an attempt to bring history to life in a fun and entertaining way. Like Nigel Tranter always said "putting the story back into history". I hope I have contributed something towards that goal.